Since nearly all the pioneers that settled south and east of Eagle Tail Hill were Romanians, they decided to name their district Boian after the village in which they lived in Bucovina. However, just four miles east there was already a district named Bojan, also settled largely by Romanians. The spelling was Austrian but the pronunciation was the same. Since it was impossible to have two districts by the same name, they decided to call their school Boian Marea. The spelling should have been Boian Mare meaning “Big Boian”, to differentiate it from Bojan. In later years the districts were called Shalka, the same as the post office, and Boian respectively. Officially the names of the schools remained as originally registered. As early as 1908 parents with children of school age began thinking of building a school. The following year the district was organized and comprised the following lands: Sections 2-11, 14-18, 21-23 in Township 56, Range 14, West of the fourth meridian. A special meeting was held in the home of Vasile Romanko on May 28, 1910, with trustees Wasyl Romanko, Nazarie Yurko and George K. Kucheran (Cucheran) present. The last named trustee was elected chairman. At this meeting it was decided to appoint Pat (Patrick) Boian of Whitford as sec.-treas. for 1910 at a salary of thirty dollars and five dollars for stamps and stationery. At the same meeting it was decided to borrow $1150. for the purpose of purchasing a site, building and furnishing a school house as well as a teacherage. On July 5, 1910 the full board met at the new school, found it satisfactory and agreed to pay the builder, Frank Mikota, $117.00 for building it. Early the following year, Pat Boian was again appointed as sec.-treasurer and George Kuchurian as chairman. The board decided to purchase forty-six primers, twelve seconds and twelve firsts and to engage a teacher. The school was built on a brick foundation of lumber and painted white. The interior was typical of the schools of the time. The north wall had a blackboard from end to end and the teacher’s desk was at the front by the blackboard. The pupils sat in double-row desks facing the front. In one corner was a small shelf for books and there on the walls were the usual maps and pictures. The children used slates and pencils. When the slates were covered with writing, they were cleaned and the students started writing again. The core subjects taught were reading, writing and arithmetic, art and grammar. At recess few organized games were played as there was no equipment of any kind. For lunch the children brought some bread, possible boiled eggs or cheese. Sometimes some of the children brought boiled potatoes or dumplings. The lunch pail was an empty lard can. The first teacher was Etta Smalley, a young attractive girl of medium height who lived south of present day Hairy Hill. Her brother would bring her to Boian on Monday morning. She stayed in the teacherage all week and Friday evening she returned home. She taught about six months as the school was closed during the cold winter months. Among the first pupils at Boian Marea school were the following: John, Dochita and Tom S. Chebree; George and Metro J. Cucheran; Domnica and Pachita J. Darda; Bill, Pat and George J. Gordey; George, John and Bill N. Hauca; Mertin and Dora P. Hauca; Nick and Bill J. Hnetka; Elie P. Hutzcal; Raveta and Domnica N. Kelba; Annie and Metro T. Kelba; Nick and John M. Moscaliuk; Alex, Metro and Steve G. Sawchuk; Ewana and Vasile J. Toma; Mary and Pachija M. Toma; John and Sanda N. Yurko. Miss Smalley was followed by a Mr. Hudson, a man of medium height, dark complexion, very artistic and a teacher who explained the lessons extremely well. In 1913 Mr. Keyes was hired as the teacher and he taught one term. He was succeeded by Earl Smalley, Etta’s cousin. Earl Smalley was a tall man, of dark complexion and very religious in his outlook on life. He was followed by Mr. Wallace, an older man who mixed well in the community. Mr. Wallace was followed by Frank J.W. Fane who taught until Christmas in 1914 and then enlisted in World War I. John B. Cavey arrived to teach in 1915, having come directly from London, England. He smoked a pipe continuously and impressed the students with his knowledge of British history. The school was closed in December. In March of 1916 the board employed George M. Mihalcheon to teach until the end of the year. In 1917 G.M. Mihalcheon attended the Camrose Normal School for a few months and then returned. The one-room school was now becoming crowded. More of the older students remained in school longer and there were many beginners starting school each year. Since the families were large, as many as five or six children from one family would be attending the school at one time. On October 24,1917 a special meeting was held at the school for the purpose of reaching a decision on adding another room to the existing structure. A vote was taken and some fifteen people voted in favor of the addition on condition that approval be received from the Department of Education. Surprisingly enough, a month later a special ratepayers meeting was held at the school under the chairmanship of Matthew Shalka. After the preliminaries were dispersed with, a motion was made and seconded that all construction on the addition be stopped. The motion was passed with a large majority. Those who voted against the motion, in other words, to have the addition completed were the following: Metro Mihalcean, Wasyl T. Toma, Geo. T. Toma, Gregori M. Toma, Wasyl Harrasim, G.M. Mihalcheon and Nicolai Darda. (Minutes of Meetings 1917). The construction was halted. Heated arguments and name calling followed. 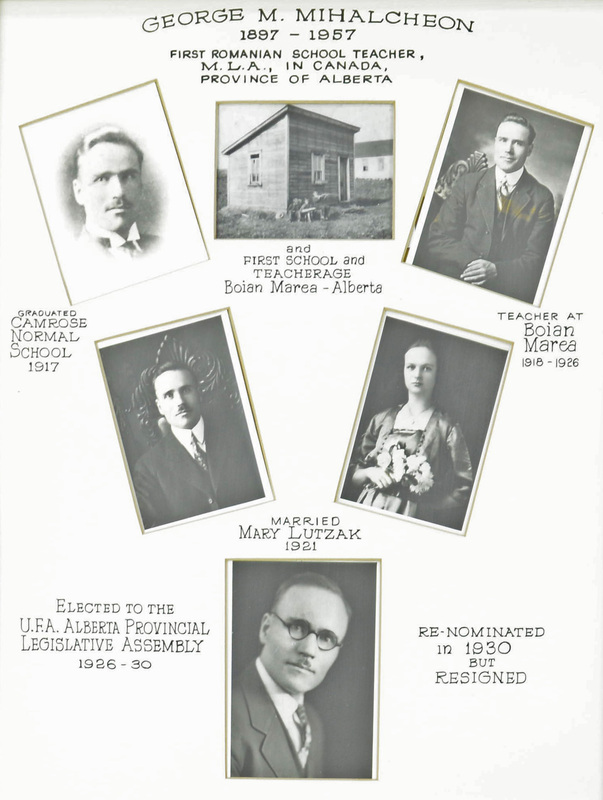 Matters got so out of hand that on June 10, 1919, J.C. Butchart, the school inspector, who lived in Vegreville, was appointed as official trustee by the Department of Education and the local school board was dissolved. c. to add two acres to the school site. This money was to be paid back in ten equal instalments at eight per cent per annum. The money was borrowed and construction was completed. For a brief period a Mr. A.C. Francis was engaged as teacher to teach from May 3rd to the end of Sep-tember at a salary of $100 a month. This gentleman was teaching a class one day and remarked casually, “If any of you do not understand any material or you have any problems just ask this chap,” and he pointed to himself. Not long afterwards on the playground and in the community he was known as “Mr. Chap”. In Sept. of that same year G.M. Mihalcheon returned to teaching. Mr. J.C. Butchart acted as official trustee until Sept. of 1922. On Aug. 2nd of that year a special meeting was called chaired by Geo. T. Toma. The purpose of this meeting was to seek permission from the Department of Education to allow the taxpayers to elect their own trustees and be self-governing. Three delegates were elected, namely, Geo. T. Toma, George Cucheran and Peter Mihalcheon. They were instructed to see the inspector as soon as possible and make known their request. As a result on Sept. 2nd another meeting was held at which the official trustee presided. A.M. Boutillier was secretary. It was at this meeting that authority for discharging the duties of trustees was placed back in the hands of the local people. The same three men who had previously been chosen as delegates, were now re-elected as trustees. Local government had been restored! The two-room school now had a gravity furnace in which coal and wood was burned. A Mr. Halverson taught briefly in the Junior Room and then Mrs. Nellie Berry arrived. She taught the junior room classes for nine consecutive years and she left a lasting impression on her classes. G.M. Mihalcheon left in 1926 when he was elected an M.L.A., running as a candidate for the United Farmers of Alberta party. When Mr. Mihalcheon left in the spring of 1926, classes were instructed by a Mr. Gardiner briefly and then Mr. Charles Seeley who completed the school term. In the fall of 1926 S.M. Matei took over the principalship. He was a local farm boy who had completed high school in Vegreville, went to Camrose Normal School and came back to teach at Boian. He taught for thirteen consecutive years and besides being a very conscientious teacher, he was very active in organizing community activities, particularly concerts and sports. In 1927, a local young man Mertin P. Hauca was appointed Sec.-Treas. for the district, a position he held until 1931 at which time Mike S. Chebree replaced him. The Romanians were a prolific people so that by 1928 the two-room school was overflowing with pupils. In 1928-29 a third room was opened in Wasyl T. Toma’s vacant house on top of the hill just north of the school. There were now three teachers: Nellie A. Berry who taught grades 1-3, Alice W. Martin who taught four and five on the hill and S.M. Matei who was the principal and taught grades 6, 7, 8 and 9. 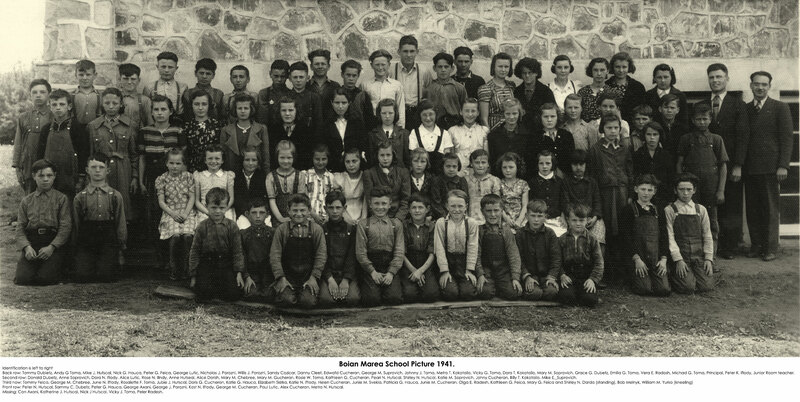 At this time Boian Marea had the distinction of being the only three-room rural school in the province of Alberta. Because of the additional expenses the mill rate was increased from 7 1/2 cents an acre to thirty mills on the dollar of the assessed value of the farm land. Mrs. Nellie Berry resigned at the end of June, 1929 and the community felt a real loss in her departure. She was replaced by Alice W. Martin. At this time the P.R. railroad had been built and the neighboring villages of Hairy Hill and Willingdon had sprung up like mushrooms overnight. School boundaries were changed and students were transferred to the newly constructed schools in Willingdon and Hairy Hill. The school population shrank so the school reverted to its previous status of a rural two-room school. In the early hours of an August cloudy night, 1937, this school burned to the ground, destroying all sup-plies, books and records. All were sacrificed to the angry gods. It was a complete loss. No one knew or was able to determine the cause of the conflagration. Immediately meetings were held to plan the construction of a new school. That fall, classes were held in the vacant parish house and in the community hall on Ion T. Toma’s farm. The Junior Room was taught by Peter K. If tody and S.M. Matei was still principal. The children enjoyed school that fall. At noon they would go berry picking in the churchyard and sometimes would forget to get back in time. 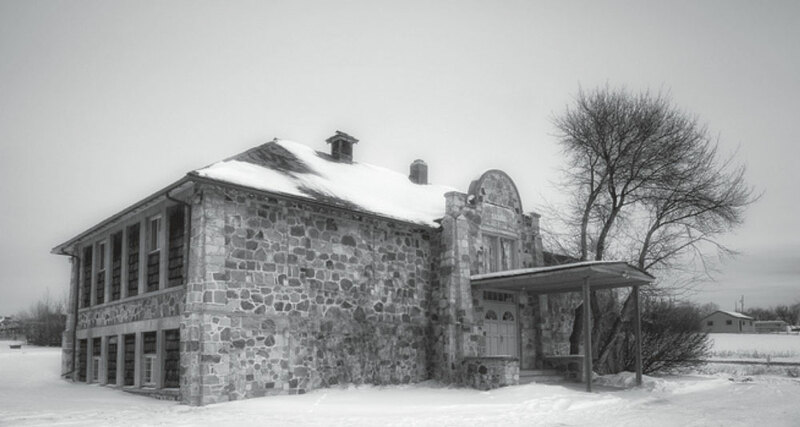 Under the chairmanship of John G. Porozni it was decided to erect a stone building with two classrooms on the main floor, cloak rooms and office space. It was to have a full basement with two large rooms and a furnace room in the center. During the thirties many of the ratepayers owed money on back taxes and so were able to pay these in the form of labor by hauling stones for miles for the new building. In 1938 the school was completed and everyone was rightfully proud of it. On Nov. 2, 1938 Boian Marea S.D. #2053 became part of the Two Hills School Division No. 21. In 1950 the school was closed and the students were vanned to Willingdon and a few went to Hairy Hill. On March 6, 1951 approval was given for the sale of the site and buildings of this school district. The community bought the property and it owns it to this day. a. The district was always borrowing money for building or for operating expenses. What else is new? b. Although school attendance was compulsory, it was difficult to enforce. c. In 1912 the teacher was paid sixty dollars per month but was charged one dollar ($1.00) per week “for the use of the residential shack and furniture”. d. In 1914 the tax rate was set at seven and one half cents per acre. If a farmer owned 160 acres of land he would pay a tax of twelve dollars. The good old days! e. In 1914 the interest rate was 8%. Not too far out of line today. f. Two additional acres of land were purchased in 1914 from Wasyl T. Toma at fifteen ($15.00) per acre. What are land prices today? h. In 1918 a young girl was employed as janitor of the school at the rate of seven and half cents (7V4#) per school day. She probably supplied her own cleaning materials too! twp. 56, rge. 14, W.4th. The official trustee was Robert Fletcher of Wostok, Alberta. On Aug. 14, 1909 approval was given for a site selected at S.E. corner of sec. 18, 56, 13, W.4th. That same year on Nov. 17, the district borrowed seven hundred dollars for the purpose of constructing and furnishing a school and a teacherage. During the fol­lowing years lands were withdrawn or added to the district, i.e. the boundaries kept changing. In 1919 Mr. J.C. Butchard of Vegreville was appointed the official trustee. Since the school population kept increasing it was necessary to build another room. On Feb. 3, 1926 the district borrowed sixteen hundred dollars for the pur­pose of paying for the additional room. When the school first opened in 1910, the teacher was Mr. Disher. When the junior room was added the first teacher was Lena W. Svekla. The treasurer at this time was George W. Svekla. In 1928 more land was required for a playground area. Hence approval was given for additional land making a total of five acres. There was room for a baseball diamond. When the school burned down in 1930, it was replaced by the existing present structure. 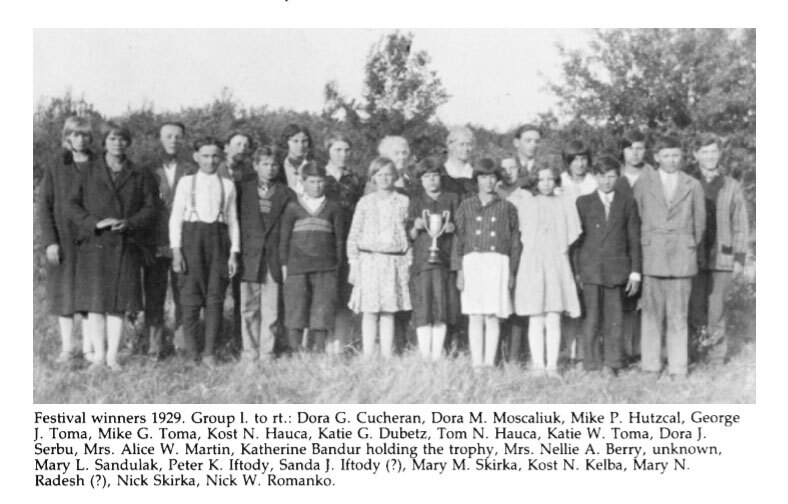 In 1937 the Bojan School District was incorporated into the Two Hills School Division No. 21. In 1955, in April, approval was given for the sale of the site and buildings. Today the grounds and buildings are still there but are seldom used.